Students come to school with a diverse range of skills and learning readiness. Delivering effective instruction to all students, including those with learning difficulties and disabilities, often presents many challenges for educators. To meet the varied learning needs of students, research shows teachers should provide (a) systematic and differentiated instruction within core reading and mathematics classes and (b) more intensive interventions to accelerate growth in those areas. 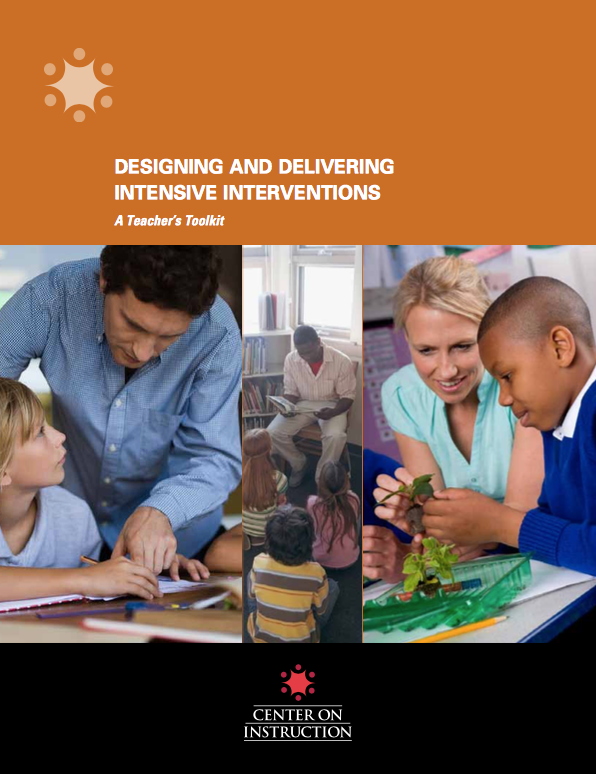 In this installment of Teacher’s Corner, we highlight what the research says about how to intensify interventions and share a “teacher’s toolkit” that helps educators design and deliver effective interventions. Increasing instructional time allows teachers to add to the amount of teaching and to the number of practice opportunities provided to students. Decreasing group size allows teachers to divide attention among fewer students and increase the potential for individualized instruction, student practice, and timely teacher feedback. Instructional delivery can be intensified and differentiated by providing more explicit, systematic instruction and increasing the opportunities for student response and feedback. Students in need of intervention often demonstrate difficulties with cognitive processing that negatively affect their reading and mathematics performance. This includes difficulties with processes such as executive functioning, self-regulation, memory, attention, and use of learning strategies. Current research supports the integration of cognitive processing strategies into academic instruction rather than a separate remediation prior to academic learning. In other words, research does not support the idea that educators can identify a processing disorder (e.g., poor short-term memory) and treat it separately from academic content (e.g., “brain training” exercises where students practice memorizing increasingly long lists of unrelated words). Rather, research supports explicitly teaching students memory-enhancement strategies, including note-taking techniques, mnemonics, and graphic organizers for remembering what was learned or read, which they can apply to academic learning. 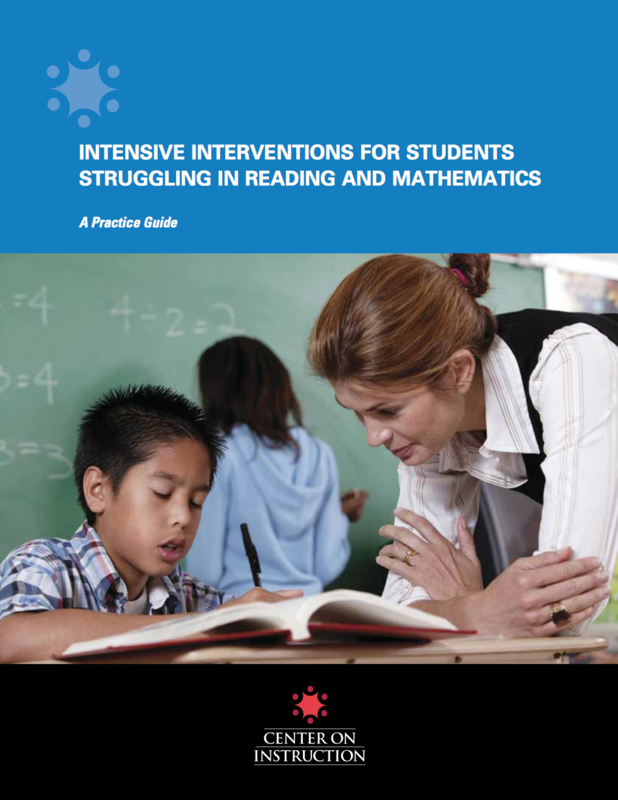 More information on each of these strategies is provided in the practice guide “Intensive Interventions for Students Struggling in Reading and Mathematics.” A full list of research citations is also included. Specifically, the toolkit includes the following resources. Example lessons highlight the difference between instructional delivery that is less intensive and delivery that is more intense and designed for students with significant learning difficulties. Some of the examples also include strategies that support cognitive processes (e.g., self-regulation). 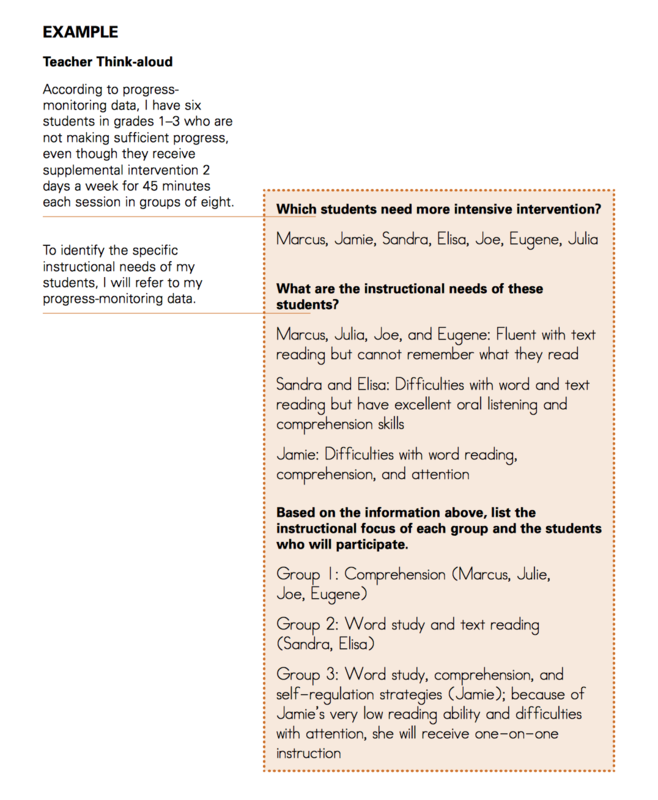 A planning worksheet guides educators through a series of research-based recommendations for implementing intensive interventions, including the use of strategies that support cognitive processes. A completed worksheet is also provided along with WHY certain decisions are made with regard to intervention. 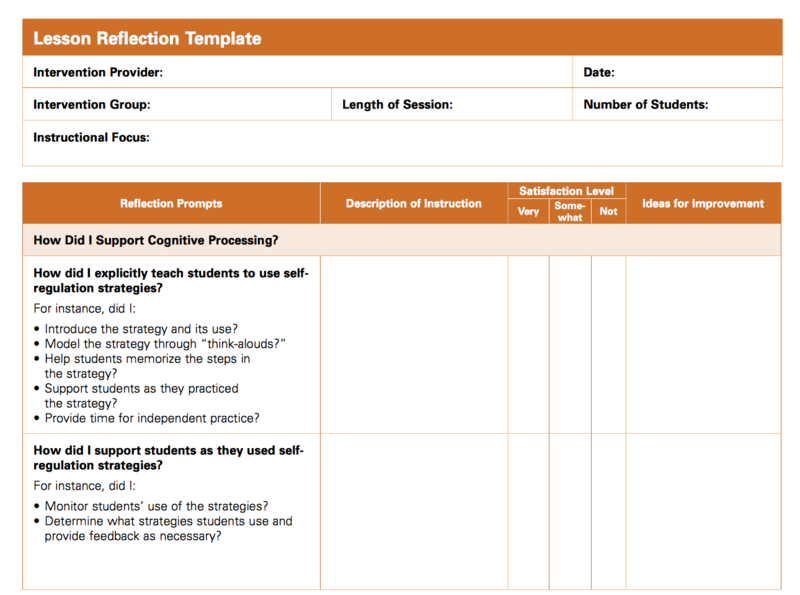 A lesson reflection template allows educators to reflect on a lesson delivered during an intervention session. Teachers can complete the reflection process individually or with a team or instructional coach. This template can double as a checklist for planning lessons so teachers can ensure all important instructional components are included in their lessons (e.g., making instruction systematic, teaching memory-enhancement strategies, embedding practice opportunities). If you have questions related to intensive interventions or other TCLD work, feel free to contact us. If you'd like to see more material like this, be sure to drop by monthly. We're also active on Facebook and Twitter, so please follow us!